Mullet is a hairstyle that is almost impossible to forget. Forever associated with men who liked to appear masculine but ended up looking just odd, a mullet is an option that will forever be associated with the 1980s. If you have a fancy dress party coming up or an eighties theme party then you can guaranteed that by using a new mullet wig as part of your outfit you will get a lot of laughs. 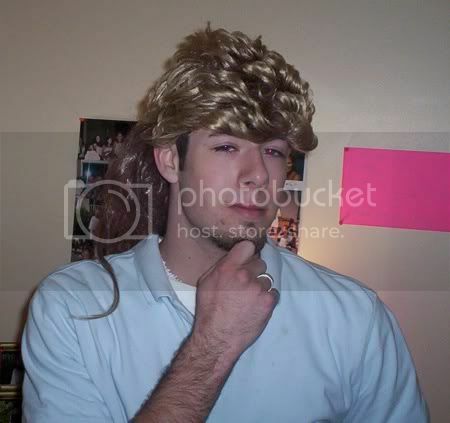 Mullet wigs are available in almost every conceivable size, color, texture, and shape. Even today there are some men and women that still style their hair in this manner. Just take a look out of your window, maybe the delivery driver in the van parked across the street has a mullet or perhaps the man mowing next doors lawn has a waterfall type mullet cascading down his back. We shouldn't just think it's in the US that mullets are a common site. People with questionable taste have been wearing mullets for many decades on every continent. Before you get hold of a mullet wig you should think about the exact style that you want. There are spiky mullets, dreadlocked mullets, silver mullets, and multi-colored options available that can give you an appearance like you have just stepped back in time. Of course you will also need the right clothes to complete the look. How about a Hulk Hogan, Billy Ray Cyrus, or Jon Bon Jovi T-shirt with a pair of acid washed jeans and some big and bright trainers? If your local fancy dress store does not stock mullet wigs then you can easily pick up the perfect design online. Also the cost available through a website would likely be less than if you were to make a purchase from a normal retail outlet.